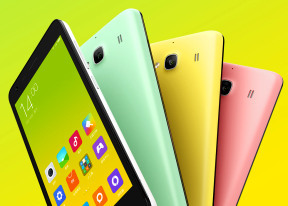 Xiaomi Redmi 2 runs on Android 4.4.4 KitKat skinned with company's latest MIUI v6 launcher. The MIUI ROMs have been around for a while and are fairly popular among the Android community. Xiaomi's customizations run very deep and replace everything including all Google services, but the good news is you can still get those from the Mi Market app. The models sold outside China come with the entire Google package pre-installed. Xiaomi MIUI v6 completely overhauls the user interface, though it keeps the same layout and operational logic. Xiaomi has put a huge effort to make the UI flat and simplistic as possible and yet keep the entire functionality intact. Before we dig into details, here's quick walkthrough of the MIUI v6 on video to get you started. The lockscreen moves the clock widget over the top left and lose the centered circle with shortcuts. All you need to do is swipe upwards to unlock. If you want a quick access to the camera - just swipe from the right side. The lockscreen widgets are no more, but you can always set protection such as PIN or password. The notification area has two semi-transparent tabs - the first one hosts all notifications, while the second one (swipe left to access) offers non-customizable quick toggles and a Settings shortcut. Unfortunately you can't bring the toggles page with two-finger swipe from the top as it is with other Android devices. Xiaomi provides its own cloud service for content syncing between devices. Each Mi Cloud account is granted 5GB of free storage. You can use it to backup contacts, messages, your entire gallery, call log, notes, settings, voice recordings, Browser content (history, tabs, webapp data) and your music library. Sounds familiar? Yes, indeed! Xiaomi's sync and backup service shares lots of similarities with the Apple iCloud. There is even a free Cloud Messaging option that allows Xiaomi users to exchange messages over the internet connection instead of being billed for SMS. Finally, if you signed in with your Mi Cloud account, you can opt for the Find device function - a handy feature in case you misplace your Xiaomi Redmi 2 or someone steals it. There is no Google Now pre-installed. The Redmi 2 comes with basic Google package - Play Store plus Google sync of app data, contacts, and browser. You can, however, get every other Google app from the Play Store, including Google Now and Maps.